An update for the Hall of Light web page: Celtic Heart, Trap Runner, Yo! Joe!, Wiz 'n' Liz, Dojo Dan, Gilbert: Escape From Drill, Crime Wave, Theme Park Mystery: Variations On A Theme, The Killing Cloud, Team Suzuki, Spacewrecked: 14 Billion Light Years From Earth, Predator 2, North & South, Nigel Mansell's World Championship, Mickey's Runaway Zoo, Mickey's 123's: The BIG Surprise Party, Globdule, Donald's Alphabet Chase, Black Gold, Bill Elliott's NASCAR Challenge, Back To The Future Part III, Dingo Et Le Train Express and Victor Loomes. An update for the MorphOS Storage web page: Deark_1.5.0.lha, GrimpsSqueakingOfTheDead, Grimorum_1.9.lha, EasyRPG_Player_0.6.0.lha, Exutil_1.1.lha, MCE_11.1.lha, DisplayInfo_1.1.lha, PyMUI_0.7.0.lha, Koules_1.34.lha, SIDId_1.09.lha, Exomizer_3.0.2.lha, AmiArcadia_25.1.lha, AmiSSL_4.3_68k.lha, dcraw_9.28.lha, Setlist-FM-dl_0.3.lha, PerCIMan_0.4.lha, MUIColorizer_1.1.lha, InstallerLG_0.1.0a34.lha and Shorten_3.6.1.lha. The web page Amigos added new articles last month: Powerglove Reloaded / Tiger Claw, Elite II, Putty Squad, Advantage Tennis, Crazy Cars 3 and a Amiga 2000 repair. On the "Games Coffer" web page you can find games, demos, animations, slideshows, diskette magazines, history, FAQ, emulators, reviews and advert Scans. The new additions for this month are: Blob-a-Blob, Bounce N Blast, Catapults, Electrek, Tetriz, Colour Changes, Senor Des Los Anillos, El, Skat Royal and Sperrgebiet. 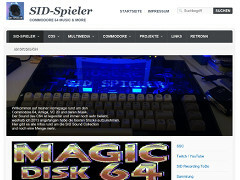 SID-Spieler is an German web page about SID music. You can find information about SID music, composers, magazines, meetings. software and much more. An update for the Hall of Light web page: Taekwondo, Thai Boxing, Steve Bak, Sim City / Micropolis, Behind The Iron Gate, Adam Skorupa, Witold Gantzke, Mariusz Prusiewicz, Paweł Banasiewicz, Za Żelazną Bramą, Subtrade: Return To Irata, Virtual Ball Fighters, Puzzle BOBS, Skyfox, F/A-18 Interceptor, Dino Wars, Downhill Challenge, Eddie Edwards SuperSki, Willys Weirdy Nightmare, Wings Of Fury, Typhoon Thompson In Search For The Sea Child, Shufflepuck Cafe and Prince Of Persia. The web page retro-commodore.eu has many high quality scans available for the Commodore user. The latest additions are: Milestone, Immortalized, Resan till $0801, VC20 Bedienungsanleitung 16K Ram Speichererweiterung, VC20 Bedienungsanleitung Programmierhilfe, VC20 Bedienungsanleitung Super Erweiterung, Input 64, Easyl Grafiktablett, Sanyo CD3195C, VI og VIC, Compute!s First book of PET/CBM, C64 / VIC20 / C128 PSU open sourced, Artpresssss, AmigaDOS 1.2, MCC Pascal, The AmigaDOS Manual 2nd Edition, ABasiC, Compute!s Second book of VIC, TextCraft, Introduction to Amiga, DeluxePaint, Photon Paint 2.0 and Amiga Graphicraft. 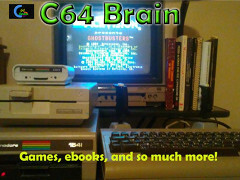 On the "Games Coffer" web page you can find games, demos, animations, slideshows, diskette magazines, history, FAQ, emulators, reviews and advert Scans. The new additions for this month are: Egg Blasters, Ouch!, Save The Trees, Schach Deluxe (DE), Starbike V11, Bally V, Domingo, Pool, Pythagoras, Dragonslayer, Dragontiles, F-15 Eagle Strike, Frontal Assault and Trailblazer. 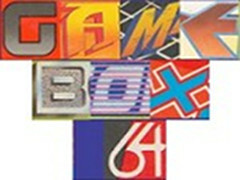 After three years the web page GameBox 64 is back on-line. On this web page you can find pictures of the game boxes, media and manuals. An update for the Hall of Light web page: Strider, Astaroth: The Angel Of Death, Leander, Stormlord, Netherworld, Michael Sinz, Carcharodon: White Sharks, Monkey Business, Simon The Sorcerer, Chris Barrie, Media Sorcery, Spike In Transilvania, Minskies Furballs, Colin Mann, Mel Wills, Kenton Mee, Obliterator, Castle Of Dr. Brain, Alien Fires 2199 A.D., ADI Junior Helps With Counting (4-5), Castles: The Northern Campaign, Kids' Academy: Paint Pot 2, Kids Type and Indian Mission. An update for the MorphOS Storage web page: Hex2_0.2.lha, VAMP_2.0.lha, RNOPDF_1.0.lha, RNOComics_1.3.lha, Links_2.17.lha, WHDLOpener_1.1.lha, ExtronControl_0_1.lha, E-Work_ECalc_Suite_0.3.lha, NetFS-revised_2.0.lha, EasyRPG_Player_0.5.4.lha, Ecalc_0.2.lha, EasyLoad_0.2.lha, Applauncher_sbar_2.3.lha, MCC_TextEditor_15.51.lha, MCC_BetterString_11.33.lha, RNOEffects_1.2.lha, FICE_1.2.6.lha, MorphZIP_0.1.3a.lha, Hashc_0.1.lha and mos2wos_0.9.lha. 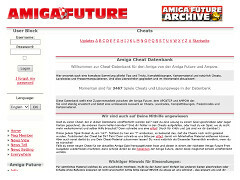 The cheats database of Amiga Future is updated weekly by David Jahn. 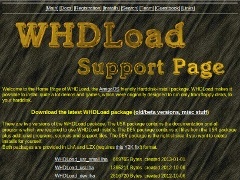 The database contains cheats, solutions, tips & tricks and Freezer addresses. The latest updates are: Nicky Boom, The New Zealand Story, New York Warriors, Netherworld, Necronom, Mystical, Motörhead, Moonwalker, Moonfall, Mega Phoenix, Marble Madness, Magic Pockets, Lupo Alberto - The Videogame, The Lost Patrol, Lost Dutchman Mine, Lord of the Rings - Volume 1, Locomotion (Byte Back), Liverpool - The Computer Game and Live and let Die. 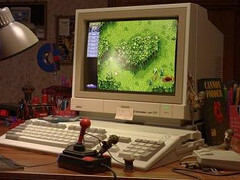 The web page Amigos added new articles last month: Alien 3, Personal Nightmare, History Line 1914-1918, Overkill, Dreamweb, SimLife and an Amiga 2500 with a Bridgeboard. The web page retro-commodore.eu has many high quality scans available for the Commodore user. The latest additions are: Lattice C Compiler 5.10 Vol 2, VI og VIC, Lerne BASIC mit dem Commodore 116/16/plus4, IC and Commodore Techtopics Issue 28. The cheats database of Amiga Future is updated weekly by David Jahn. 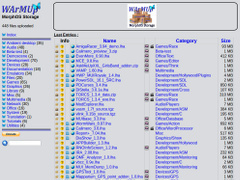 The database contains cheats, solutions, tips & tricks and Freezer addresses. The latest updates are: Mega Phoenix, Marble Madness, Magic Pockets, Lupo Alberto - The Videogame, The Lost Patrol, Lost Dutchman Mine, Lord of the Rings, Locomotion, Liverpool, Live and let Die, Lionheart, Lin Wu's Challenge, Line of Fire, Licence to Kill, Lethal Zone, Lethal Weapon, Lemmings 2 - The Tribes, New Year Lemmings 1991/92, Oh no! More Lemmings and Leander. 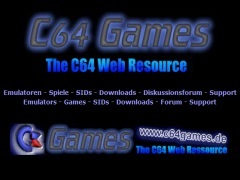 The web page c64games.de had an update. You can now find 6714 games on this web page. The new games are: Algol, Atom Heart, Ceti 21, Cosmic Relief, Designasaurus, Electric Warrior, Moon Over Afghanistan, Scruples, The Last Hugger, The Last Hugger - RX and Valkyrie 3. DLH's Commodore Archive is a web page for Commodore documentation. You can find magazines, books and manuals. The latest additions are: Amiga User International, Indiana Jones and the Fate of Atlantis, Britannica AD Software Presenting our Family to your Family, Term Paper Writer 128, X-10 Powerhouse, Devpac 3, The 5 Dollar Talking Disk and Take Down. The web page retro-commodore.eu has many high quality scans available for the Commodore user. The latest additions are: Vicriter 2, GVP FaaastPREP 2.0, A1011 3.5" External Disk Drive User's Manual, Amiga 2630 Accelerator Card User's Guide and Amiga Hard Disk Benutzerhandbuch. 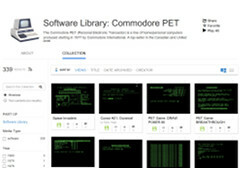 DLH's Commodore Archive is a web page for Commodore documentation. You can find magazines, books and manuals. The latest additions are: Family Roots Instruction and Reference Manual V1.7, The Worlds Greatest Football Game Playbook, Amiga User International, Captain Power, Recreation 6 Pack (VT-106), An Introduction to BASIC Part 1, Cockroach Turbo-ROM, Know Your Own IQ, Blackbird, SpeedCalc, Syntech Studio I, Pascal-64, Action Replay Enhancement Disk V4, Maverick, Renegade, Fast Hack'em 3.2A Datel and The Lucky Report. An update for the Hall of Light web page: Alien Breed: Tower Assault, Cougar Force, Marcus Dyson, Martin Brown, Steve Tibbett, Sir Ababol, Birra, Tom, Goblins, Robot Readers: The Three Bears, 10 Out Of 10 English, Junior Typist, King's Quest V: Absence Makes The Heart Go Yonder, Catch 'Em, Moonbase: Lunar Colony Simulator, Bush Buck: A Global Treasure Hunt, Midwinter, Realms, Blinky's Scary School, Dale Brown, etc. On the "Games Coffer" web page you can find games, demos, animations, slideshows, diskette magazines, history, FAQ, emulators, reviews and advert Scans. 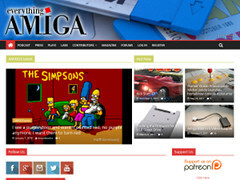 The new additions for this month are: Dinowalker, Lost In Space, Marcos Box-O-Fun, Millennium Anim, Unicycle, Amigafox V1.0, Magnetic Pages V1.0, Rippers Guide, The, Time Utilities and Zodiac Compacter. 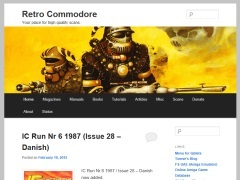 The web page retro-commodore.eu has many high quality scans available for the Commodore user. The latest additions are: Koala Paint, LightPen and Tablet manuals. The web page Amigos added new articles last month: Flood, Ghostbusters, Superman, Dreamkatcha, Worthy and Arcade Pool. 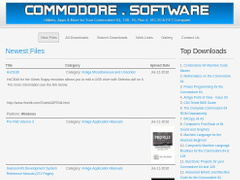 The web page Commodore.software has had an update with many new items: Kracker Jax Elite v2, Disk Invader v9.9, 17 Seconds 40 Track, Alf Utilities, Chrome Utility Disk 1, Scene World - Issue 28, C64 Archiv v4.0 and CBMPrgStudio v3.13.0.